In an earlier blog, I mentioned that my friend was complaining about all the money she spent on hair products while trying to find the right ones for her hair type. I gave her some suggestions on different Mane ‘n Tail grooming solutions that might work for her. But I also encouraged her to read labels and do some homework before she emptied her wallet again. It’s important these days to read the labels of the products you’re thinking of buying. And it’s important to go beyond the front of the package, which is probably engineered to catch your eye and appeal to your visual sense. Turn the package around and read the small print. In the labeling and descriptions of our Mane ‘n Tail products we try to give you the important information while also describing the end results of our products. 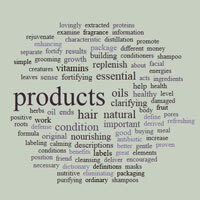 Let’s examine and define some of the words we use and how they relate to our own products. For help, I went to the Oxford Dictionary for definitions and examples. Definition: A natural oil typically obtained by distillation and having the characteristic fragrance of the plant or other source from which it is extracted. Essential oils is not actually an “oil” in the traditional sense of the word. They are all natural products derived from the plant (bark, flower, fruit, leaves, root). Example: Essential oils can deliver positive benefits to the body which include soothing, calming, stimulating, refreshing, centering, and warming to the system. 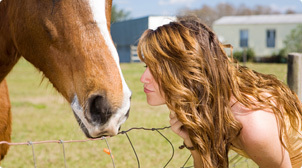 Mane ‘n Tail Products: We use essential oils in our products because they are natural ingredients already proven to have great results, eliminating the need of certain chemicals. Try our Olive Oil Crème. Definition: Increase the nutritive value of, especially with vitamins. Example: Garlic acts as a natural antibiotic fortifying and enhancing the body’s defense systems. Mane ‘n Tail Products: Adding essential oils, herbs and vitamins fortify our products because they help fight damaged hair and split ends. Try our Hair Strengthener. Definition: Containing substances necessary for growth, health, and good condition. Example: Margaret made a simple, but nourishing meal. Mane ‘n Tail Products: When we use the term nourishing in describing our products, we mean simply that it’s good for your hair. It conditions your hair and helps promote healthy ends, roots and growth. Try our Original Mane ‘n Tail Conditioner. Definition: To separate out the impurities. Example: Facial masks rejuvenate the skin by clarifying the pores. Mane ‘n Tail Products: Our Gentle Clarifying Shampoo is made with a cleansing and purifying formula. Definition: Restore (a stock or supply of something) to the former level or condition. Example: All creatures need sleep to replenish their energies. Mane ‘n Tail Products: Our shampoos and conditioners will replenish your hair with the vitamins and proteins it loses through styling and ordinary wear and tear. Try our Color Protect Shampoo. Definition: Return (someone or something) to a former condition, place, or position. Example: The building has been lovingly restored. Mane ‘n Tail Products: By replenishing your hair’s natural elements, we are helping to restore it back to its original, healthy condition. Try our Herbal-Gro Spray Therapy. Through our packaging and descriptions, we try to give you a better understanding of what our products do and how they do it. But don’t take our word for it! Read some reviews and test out our products. Find out for yourself what’s in a word.